Hyper Text Mark-up Language is a standard mark-up language developed by Tim Berners-Lee inventor of Worldwide Consortium(W3C) used to create web pages in a text-based approach. These documents are simple plain text and created with a text editor and can be followed by a web browser. It consists of elements, defines different parts of the document. HTML tags are used by web developers to specify paragraphs, images, tables. They are useful for beginners in web designing Platform. It is not a Programming Language. Web developers make use of HTML for their web sites at free of cost. It is abbreviated as HyperText Mark-Up Language, it is a text-based mark-up language tells a browser how to display images, fonts and other multimedia elements on world wide web. It is a method by which you can go any anywhere through the internet with the help of special text hyperlinks which moves to the next page. How does HTML make working so easy? finally, a list of information to display. The are various subsets which are XHTML, XML, DHTML. XHTML is an extensible HTML language which is extension of html and it is written in xml .XHTML uses same tags as HTML except for some rules with HTML documents are rooted and written in lowercase by default. HTML is familiar for mobile web design (accessing browser through mobile phones need a XHTML supporter). Next comes SGML (Standard Generalized Mark Up Language) standardised by ISO , is a Language for defining markup Language for HTML. Extensible Markup Language XML focus on what data it is to describe them. They define a set of rules and create own customized tags. XML is a meta-language and defined in XML1.0 specification by w3c. Dynamic HTML(DHTML) or HTML4 used to create interactive animated websites and gives more control to the HTML elements. HTML makes their page to change over time(dynamic) without seeking the help of a server. Features include updating of the site, drop down menus rolling upwards and downwards buttons. Time Text Mark-up Language (TTML2) is textual information associated with timing information. we can create awesome design email for a customer for their Online Marketing. Using HTML, forms can be built. To add forms to a page<form>element are used. Allows users to select data using drop-down lists. Creating corporate Newsletter by customizing the template. Creating personal blogs to show off your working on. Creating email using the href attribute. Client-side storage using cookies which is feasible in HTML5. Helps in development of a game with a feature of APIs and plug-ins. Opens a link in the same window may also be opened in a new window. To do so need of target attribute determines where exactly a window is displayed. The latest version of HTML5 brings advanced streaming video, audio and provides offline options to view the content. Body structure contains the text that is to be displayed. The head section includes a page title. Save the file has filename.html. When you execute it, you can view it directly in a browser. The table tag display data in tabular form. Design of a page includes some lists which give added values. Those lists include ordered list<ol>, definition list<dl> <dt>. To enhance the basic structure of the HTML into styled content information Cascading Style Sheet (CSS) is used. Those styles include fonts, color, background images. CSS used to control layout and presentation in code. Including style sheet to a document Saved in the file name as filename.css. Its elements have in-line and block level elements. Inline elements cover local effects like bold, italic. Block level elements include lists, paragraphs. The other feature like an image map which links many different web pages with a single image. <tr> denotes table row, <th> denotes table heading, <td> table data. Hyperlinks: Which links to another web page. Important forms elements include <input>, <select>. It is widely used and easy to learn. Tags used here are basic and in the readable format enclosed in angle bracket. It is free, not necessary to buy individual software and its syntax is very similar to XML. They are easy to design with HTML editors called “WYSIWYG”. They are easy to download as the text (Plain text) is compressible. The code is easy. It has good ease of handling and efficiency. All browsers can read HTML files and pages. HTML is static whereas HTML5 is dynamic. It is platform independent displays in all browsers. Using Canvas by an HTML allows web developers to use graphics. They have a feature called application cache which stores large files. It doesn’t require any pre-requisite to learning as they are easy to learn. It can be learned within a week and background knowledge in computers are required to understand the elements of the document. You will need a text editor such as a note pad to type a code. Even Picking up to learn CSS is mandatory which is used to specify pages styles. Learning CSS makes overall skillset to a higher level in creating websites. These two languages are essential for being a good web developer. Why should we use HTML? It has Built-in Audio video playback which seeks on third-party developer like Adobe Flash Player. Optimized for higher ranking in search engine. Benefits of offline caching, with no internet connection sometimes a page is still alive to see the content. Interconnect all kinds of devices. 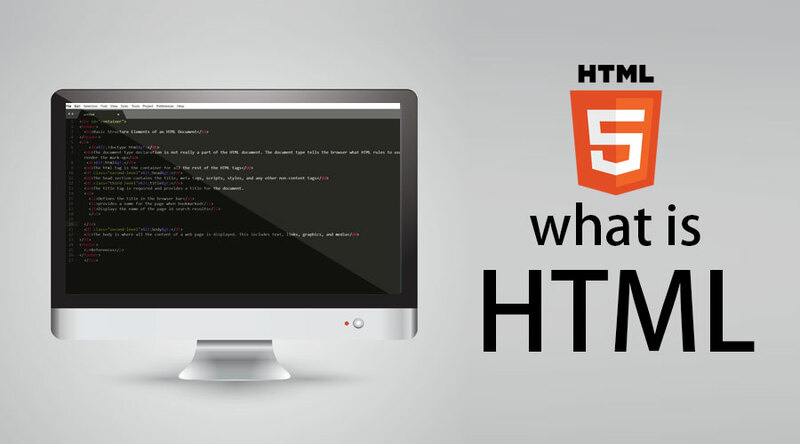 HTML 5 is the current version of HTML gives the latest enhancements for client-side forms. Nowadays all the browser(Chrome ,Firefox, Opera,Internet Explorer) supports HTML5 as updated versions. Learning it gives us how to create forms, tags, doctypes, Queries. Many enterprises like facebook, linkedin, financial times see great importance in using HTML5 as it allows cross-platform deployment. They provide cookies for storing data in the browser for future views. Also, it is essential in email for an attachment of images as well as videos. Demand for web programmers is extremely high as they are related with front -end web development on their own. If programmers write code for websites creation and applications, they are hired by companies to have growth in product and their properties. Skilled programmer and programmers still have a job opportunity. By picking up fundamentals on HTML and CSS we can have opportunities on freelance, part-time/full-time jobs providing valuable pay on the work experience and on the job training. Once you get Learn HTML job seekers can get social media manager job, junior web developer, Quality Assurance engineer in development process-mail marketing services needs custom email templates, build a personal website for a client which is win-win for all, the client gets benefited and we can experience on work and a paycheck. Other job roles include MVC developer, ASP.NET developer which requires knowledge as it gives flexibility across different platforms. Therefore, It is just style information and structure and not a programming language and they act as a front end of every web application. With knowledge, we can create an interactive media web application. the Web components (creates own API) are an emerging technology that allows creating web apps. To start building websites learning HTML elements are best to visually display on web page. A career is booming high these days as e-commerce is evolving at a faster rate which includes online shopping whether it is of mobile or desktop application browsers are enabled with mark – up languages. When implementing HTML5 in mobile application performance and memory should be a key consideration. To make a page content dynamic HTML uses server-side Includes (SSI).